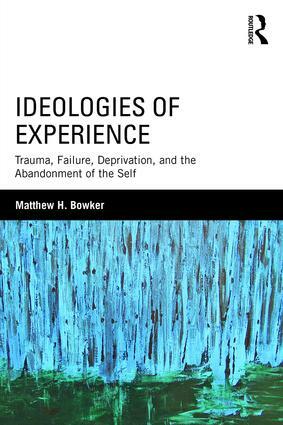 Matthew H. Bowker offers a novel analysis of "experience": the vast and influential concept that has shaped Western social theory and political practice for the past half-millennium. While it is difficult to find a branch of modern thought, science, industry, or art that has not relied in some way on the notion of "experience" in defining its assumptions or aims, no study has yet applied a politically-conscious and psychologically-sensitive critique to the construct of experience. Doing so reveals that most of the qualities that have been attributed to experience over the centuries — particularly its unthinkability, its correspondence with suffering, and its occlusion of the self — are part of unlikely fantasies or ideologies. By analyzing a series of related cases, including the experiential education movement, the ascendency of trauma theory, the philosophy of the social contract, and the psychological study of social isolation, the book builds a convincing case that ideologies of experience are invoked not to keep us close to lived realities and ‘things-in-themselves,’ but, rather, to distort and destroy true knowledge of ourselves and others. In spite of enduring admiration for those who may be called champions of experience, such as Michel de Montaigne, Ralph Waldo Emerson, and others treated throughout the work, the ideologies of experience ultimately discourage individuals and groups from creating, resisting, and changing our experience, urging us instead to embrace trauma, failure, deprivation, and self-abandonment. Matthew H. Bowker is Visiting Assistant Professor of Liberal Arts at Medaille College in Buffalo, NY. His work applies psychoanalytic and literary-critical approaches to topics in political philosophy.